1. Chicago-Detroit, 58 seconds left in the first half, Detroit quarterback Matthew Stafford passes to Golden Tate at the goal line. The ball is caught momentarily and then stripped and lands in the hands of Bears linebacker Jonathan Anderson. Officials on the field rule the play an interception, and the call then goes upstairs for a booth review. Turnovers in the last two minutes of the half are automatically reviewed. 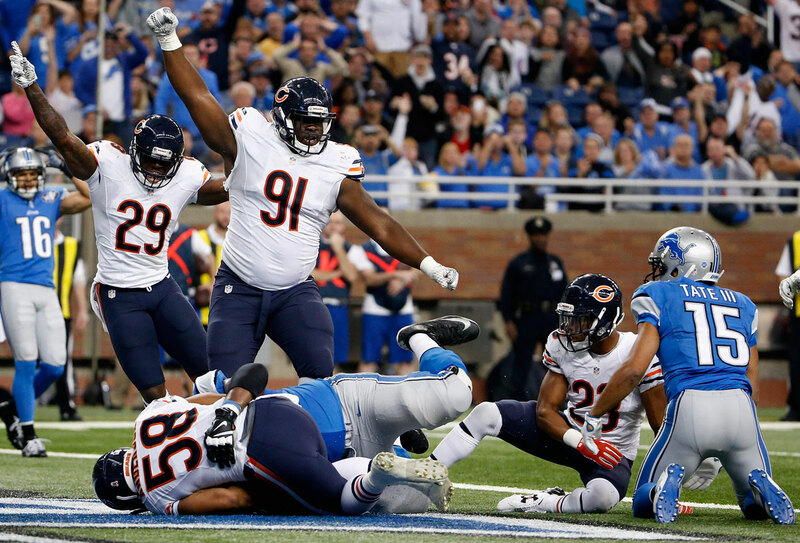 Bears and Lions fight for the ball on Golden Tate’s controversial touchdown catch. Referee Walt Coleman went under the hood and watched the replay and consulted by headset with vice president of officiating Dean Blandino in the NFL officiating center in New York. Coleman saw enough evidence to reverse the ruling. Obviously, he saw Tate gain possession of the ball with both feet down and then move to run while the Bears defender was attempting to strip him. It was very close, and I’m not sure I saw indisputable evidence. It’s the kind of play that if the officials let the ruling on the field stand, I don’t think anyone could have beefed. But Coleman overruled the interception and called it a touchdown. Tate had possession after two steps, and he was across the line into the end zone. Did he make a move clearly to become a runner as he crossed the plane of the goal line, before the moment when the ball was stripped? Very, very close. 2. New England-Indianapolis, late third quarter, fourth-and-three, Colts 37, Colts run a fake punt play with wideout Griff Whalen at center and safety Colt Anderson receiving the snap. Officials flag Indy for illegal formation. Rule 7, Section 5, Article 1 of the NFL rules manual mandates that the offensive team must have seven or more players on the line of scrimmage when the ball is snapped. It’s legal for the center—Whalen in this case—to be the last man on the line, just so long as six other Colts are also on the line, making it a total of seven. So, in this case, as nine players split out wide right and Whalen and safety Colt Anderson stay at the ball, with Anderson set to receive the snap under center, only one of the players to the right is on the 37-yard line: free safety Winston Guy. Five players are aligned for Indianapolis at the 35-yard line. Those five players should be lined up next to Guy at the 36- or 36-and-a-half-yard-line, so their bodies can be either on or very close to the 37. Clearly they are not close. Not even the Colts players apparently were up on the nuances of alignment rules. The Colts, I am told, informed the officiating crew before the game that they were going to run a trick play on a fake punt. So from the replays, you see no panic not only from the Patriots, but from the officials either. They were on top of the play and threw the flag quickly for the illegal formation. The upshot: Even if the Colts pulled off a miracle in making this stupid play work, it would have been called back, and Indy would have had fourth-and-eight from its own 32. It’s amazing to think that, with all the time the Colts put into this play (Indy punter Pat McAfee said the team started working on it last season), the players who were sent onto the field would not know the rules—that seven of them needed to be on the line to avoid a flag. It points to poor preparation and poor fundamentals, never mind a preparation issue when Whalen incomprehensibly snapped the ball with five Patriots lurking to smother the ball-carrier. 1. New England (5-0). And now for something completely different: The Jets come to Foxboro, and it’s not going to be a war of words. First-year New York coach Todd Bowles wouldn’t be caught dead saying anything bombastic this week, and you can be sure he’ll pass the message to his players when they reconvene for game-prep on Wednesday. Should be a great one. 2. Green Bay (6-0). Pack is averaging 22.7 points per game this month. The bye this week is a godsend. At some point Aaron Rodgers needs to line up with at least one healthy wide receiver. 3. Cincinnati (6-0). Actually considered moving the Bengals over Green Bay this week. Why not? They’re outscoring and out-throwing Green Bay, and both are playing good defense. Bengals have the bye this week too. It’s a long season. Never thought I’d think Cincinnati is better than an Aaron Rodgers’ Packer team, but we shall see. 4. Carolina (5-0). Okay, I’ll shut up. You proved it, Panthers. 5. New York Jets (4-1). 6. Denver (6-0). Read Klemko today on Peyton Manning. There is a melancholy around the veteran quarterback right now, obviously. No other QB in football has as bad a TD-to-INT differential right now as Manning’s minus-3. I will have some thoughts on Manning and the Broncos on Wednesday, including some impassioned Gary Kubiak words. 7. Pittsburgh (4-2). Why I am starting to be bullish on the Steelers: There’s a good chance I’d have picked them to lose at San Diego and at home to Arizona even if Ben Roethlisberger had been playing. But Mike Vick won the Chargers game, and Landry Jones relieved Vick and beat the Cardinals with two nifty touchdown throws. Keith Butler and that defense are doing great. I’ll tell you what’s an intriguing game this weekend: Landry Jones at Arrowhead—assuming Vick’s ouchy hamstring keeps him out a week or two. If Jones wins that one, it’s his job until Ben returns. 8. Arizona (4-2). No harm in stumbling at Heinz Field. The Cards still are in the driver’s seat in the NFC West. Can’t afford to falter, though, against the Ravens or Browns before the bye. 9. Atlanta (5-1). One weekend showed me that the NFC South balance of power tipped toward Carolina over the Falcons. Eight weeks still, until the two teams play, to see who actually is better. 10. Minnesota (3-2). Surprised that Teddy Bridgewater, with the pocket presence and smarts I’ve seen in him so far, has thrown just three touchdown passes in five games. Offensive coordinator Norv Turner has to be scratching his head a little bit, because there’s enough talent in the receiver/tight end group that Bridgewater should be throwing two a week. 11. Philadelphia (3-3). Still so much about the Eagles that is uncertain—such as, is Sam Bradford ever going to show franchise-QB form? Philly has won three of four, but the Monday-nighter over the Giants was one of the ugliest games and least satisfying wins in this long rivalry. 12. San Diego (2-4). One completion. One lousy completion. That’s how far the Chargers were from going to overtime with the Packers at Lambeau, and how far Philip Rivers was from, perhaps, a 575-yard passing day. BTW, Keenan Allen is averaging 8.9 catches a game. He might be good. 13. New York Giants (3-3). Went to bed after the 19th penalty, with the Eagles up 24-7 and about a minute left in the third quarter. What’d I miss? Any competence in the fourth quarter, on either side? 14. Seattle (2-4). I keep think we’ll wake up one of these mornings, and the Seahawks will an have an offensive line that doesn’t look like it just got plucked out of the Patriot League. 15. Miami (2-3). Strangest team to predict right now. But that defense looked as ferocious as the Killer B’s Sunday in Nashville. 16. Cleveland (2-4). For as smart as Josh McCown is, he throws some brain-lock interceptions. 17. Indianapolis (3-3). Still trying to digest the strangest, dumbest fake punt call I have ever seen. 18. St. Louis (2-3). Could 4-3 beckon? Cleveland and the Niners, both at home, in next two weeks. 19. Oakland (2-3). Could 2-6 beckon? Chargers, Jets, Steelers up next. 20. New Orleans (2-4). There’s hope for the men of Brees if they can keep forcing turnovers.